This is the first examination in depth of the reasons and ways that people seek psychiatric help. Viewing contemporary metropolitan life from the standpoint of an experienced social analyst, Charles Kadushin deals with such issues as, why people believe they have emotional problems, what types of problems send them to psychiatrists, how, why, and by whom potential patients are told they are disturbed, why people choose psychiatry over other healing methods, and why many people do not receive treatment from the sources to which they apply. The author develops a new theory of social circles, describing how people move in a network of friends and acquaintances with varying degrees of knowledge of and interest in psychiatry. This factor affects decisions to obtain professional help and also has bearing on the types of problems presented. The study encompasses a wide variety of persons in a complex community environment--New York City, the psychotherapy capital of the world. The basic data were obtained from 1,500 patients in ten psychiatric clinics in three major treatment areas medical, analytic, and religio-psychiatric. 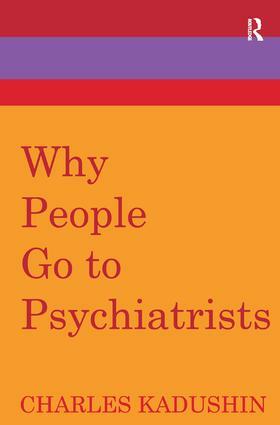 The book provides new insights into the motivations of the patients as well as information about their social setting. It is an informative and engrossing work for students and scholars; for sociologists in the areas of medicine and mental health; for psychiatrists, clinical psychologists, and social workers actively engaged in treatment and casework; and for all professionals in the community health field.